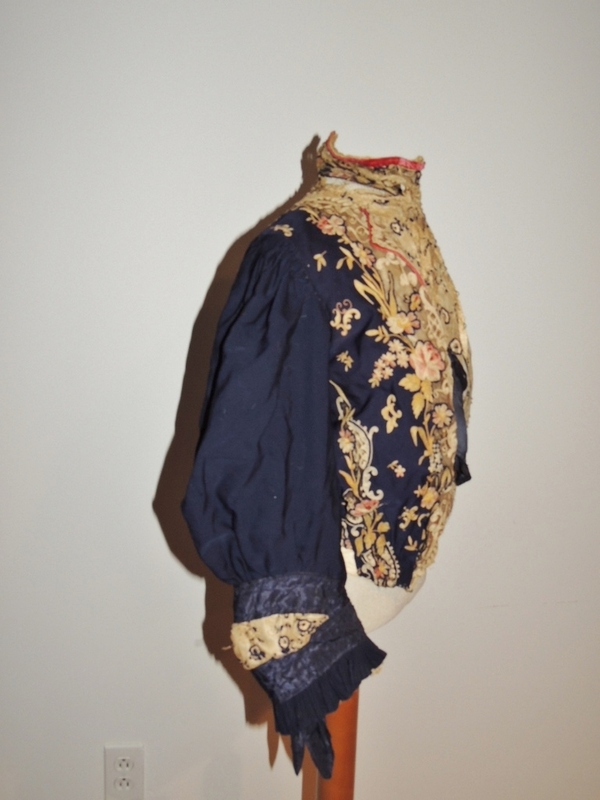 This gorgeous ca 1905 bodice is made from a fine, light weight wool in navy. 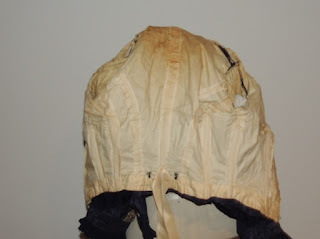 It's lined in ivory cotton with bones, some staining to the lining across the back/shoulders. It has an embroidered tulle panel down the center front (few pulled threads), it's backed with tissue silk (tearing) and was lined in silk taffeta (gone). The front edges are trimmed with a pretty ivory embroidered lace (few minor repairs, few light stains) and has beautiful embroidered flowers in pinks, white, blues, greens, tan and yellow. 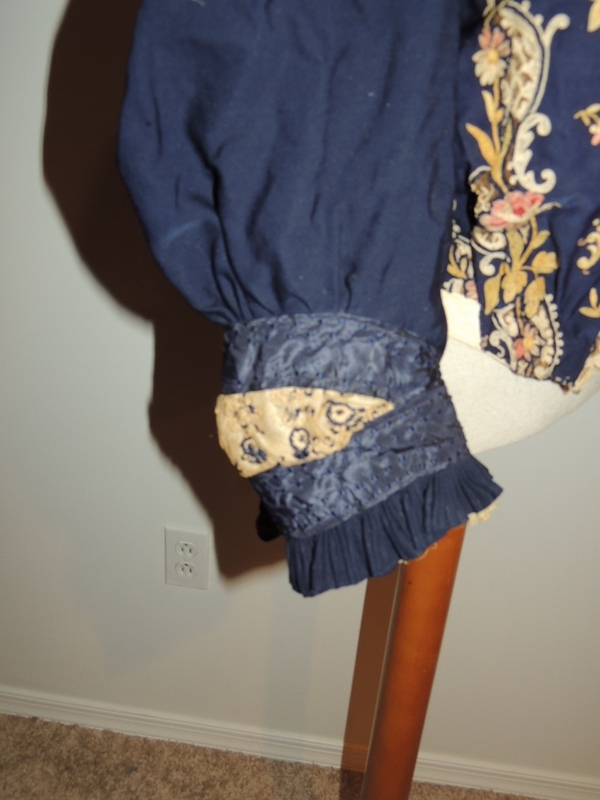 There's small areas in the embroidery that have lace inserts. 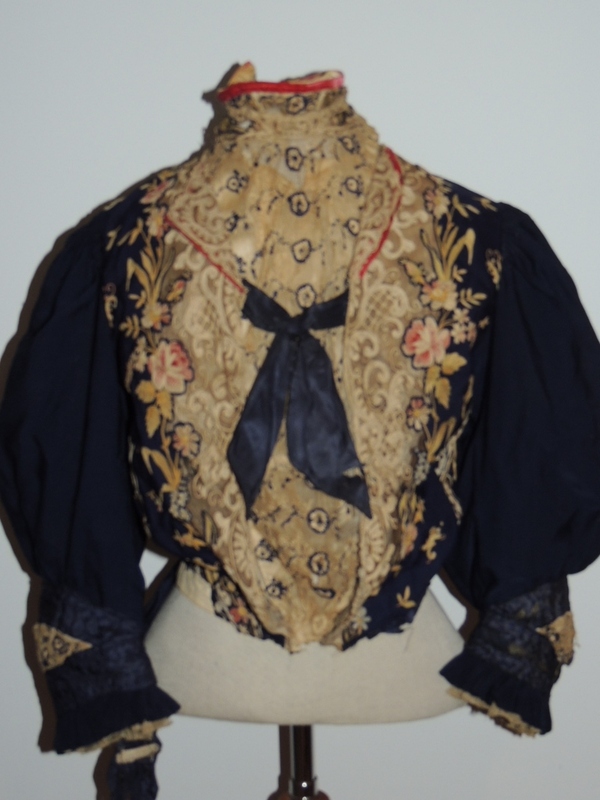 The 3/4 length sleeves hafe an insert about mid arm with a taffeta band around it with embroidered dots an dit has an accordian pleated ruffle around the bottom. The back of the bodice is very ornate. The sleeves is gathered and very full at the top. There's a tear in the tulle below the collar in back, the collar has several breaks in the tulle where the embroidered pieces are but should be easy to restore, also a very small hole on the underarm seam that can be easily taken into the seam. 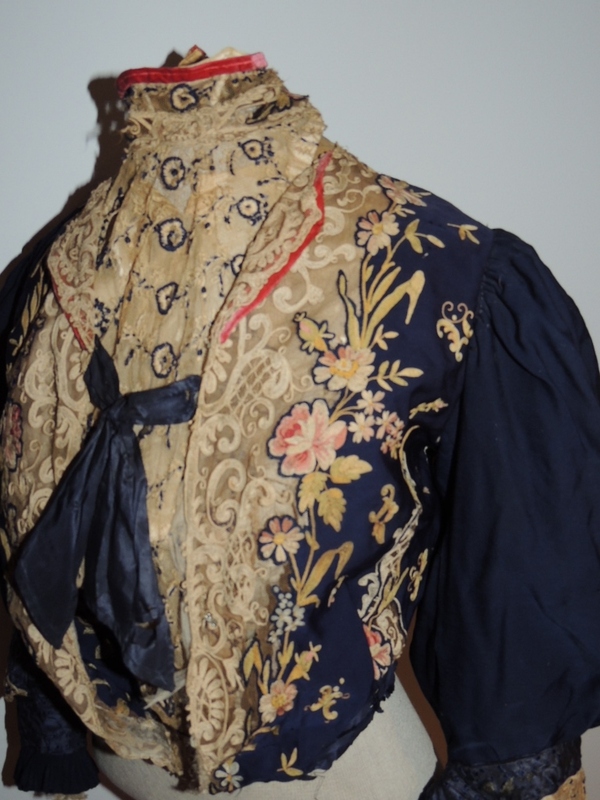 The collar and little lapels are trimmed with rose colored velvet. IT has a pleated cummberbund around the bottom edge that should be replaced. 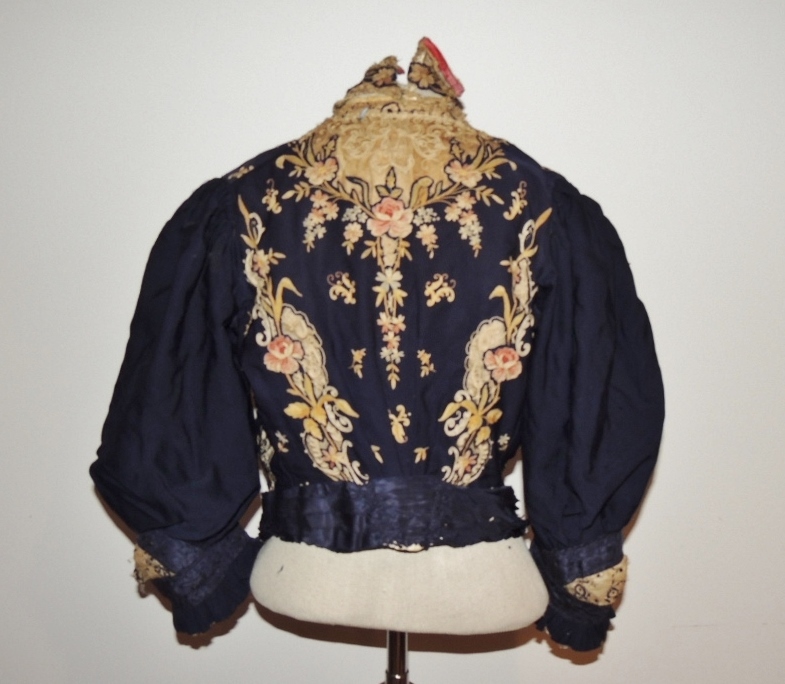 It measures 40 1/2 inches around the bust, waist is 24 1/2, across the back shoulder is 12 7/8 inches and it's 19 1/2 inches from shoulder to center front point. Very good, restorable condition. Based on the shape and length of the sleeves, I'd say 1906. 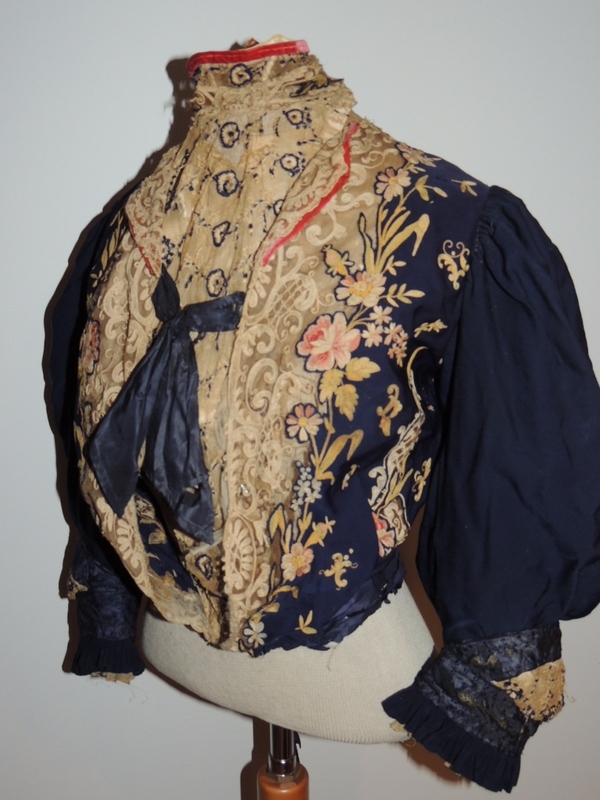 However, I *love* this bodice. It's quite lovely. 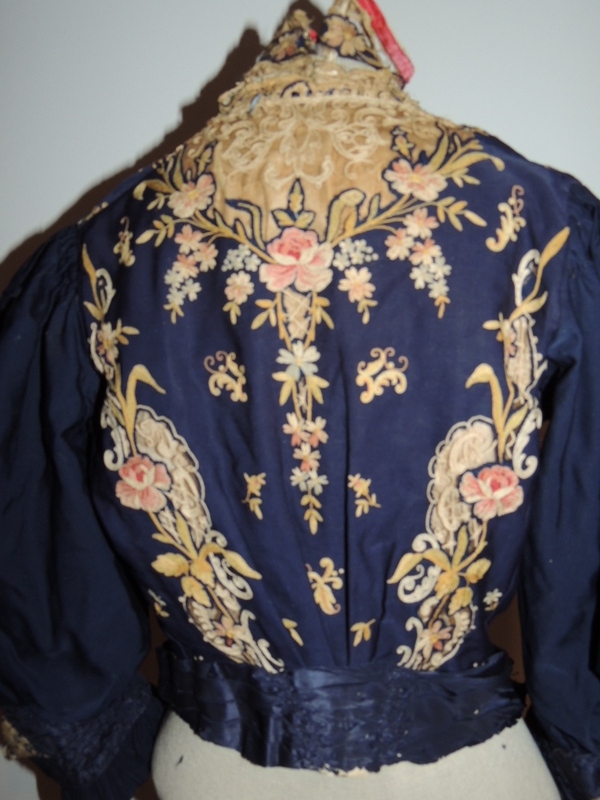 The floral details on the front and back are well balanced. The colors work well together and it's detailed without being over the top. How pretty! How I wished they had fabric with patterns like this on them now. I would like it better w/o the circle pattern fabric in the center. A solid would show off the gorgeous floral designs all the better. The back is making me lick the screen. 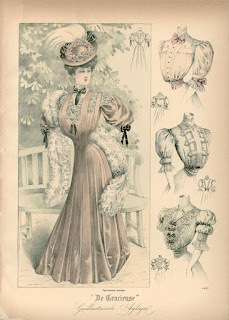 You could probably get away with some border prints now to get a similar styled bodice. I actually kind of like the blue circle lace - to me, it brings out the blue of the rest of the bodice and ties the colors all together.